Today, the UK Gambling Commission has published its yearly Young People and Gambling report, based on a study by Ipsos MORI, and found that 14% of children between eleven and sixteen years old had gambled in the past week. This is two percent higher than last year, but it’s still low compared to historical data such as 2011’s 23%. The report has a dedicated chapter to the issue of loot boxes in video games, which we’ve extensively covered here on Wccftech. According to the study, 31% of the participants have ever opened loot boxes in a computer game or app, to try to acquire in-game items, while 3% claim to have ever bet with in-game items (the so-called ‘skins’ gambling). Overall, almost a million young folks were exposed to gambling via loot boxes, be it through mobile games or PC/console games. ‘Skins’ are in-game items, used within some of the most popular video game titles. They provide cosmetic alterations to a player’s weapons, avatar or equipment used in the game. Skins betting sites allow video gamers to wager cosmetic items rewarded in-game or purchased for real money on a digital marketplace, accessible from the UK for several years. gambling licence is required. Tackling operators making gambling facilities available to children is one of the Gambling Commission’s priorities. This has been demonstrated by action taken against unlicensed websites providing facilities for gambling using in-game items as methods for payment. For the purposes of this survey, with the aim of ensuring as much comprehension of the activity as possible, the topic was introduced to young people as follows: ‘When playing computer games/mobile apps it is sometimes possible to collect in-game items (e.g. weapons, power-ups and tokens)’. 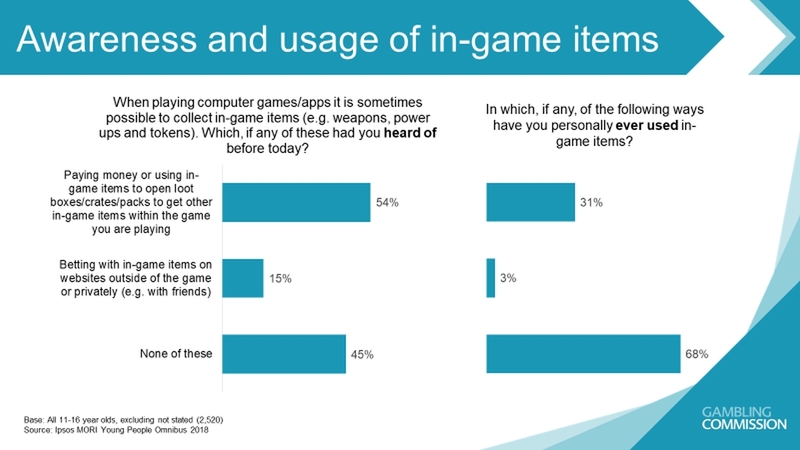 Respondents were then asked if they were aware of different ways of using in-game items and if they had ever personally used in-game items in these ways. Overall, based on the description provided, 54% of 11-16 year olds were aware that it is possible to pay money or use in-game items to open loot boxes/crates/packs to get other in-game items within the game you are playing, and 31% had ever used in-game items in this way. Boys (64%) were significantly more likely than girls (43%) to be aware of this type of usage. Somewhat fewer young people (15%) were aware that it is possible to bet with in-game items on websites outside of the game or privately (e.g. with friends), and only 3% claimed to have ever done this. Boys were also significantly more likely than girls to be aware of this way of using in-game items (18% of boys compared to 11% of girls). About a year ago, the UK Gambling Commission expressed concern with regards to the increasingly blurred lines between loot boxes in games and gambling. A couple of months ago, it reiterated those concerns alongside fellow regulators from European countries like Austria, France, Portugal, Spain and many more. Meanwhile, the implementation of loot boxes seems to be on a downward trend in triple-A games this year.